The discovery of tiny specks of bread dating back 14,000 years means that anyone on the paleo diet can now go back to eating the delicious staple. 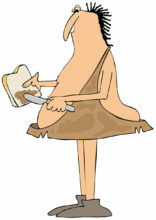 You can eat bread on the paleo diet! Followers of the paleo diet, also called the caveman diet, believe that our digestive systems have not changed since the stoneage and cannot adequately process ‘newer’ foods, such as bread. Therefore they only consume the foods they believe our ancient ancestors ate. Bread, potatoes and legumes, among other things, are shunned by those following the regime. This is great news for all bread-lovers who want to eat like a caveman. And if archaeologists do start researching more food remains perhaps other foods can go back on the paleo menu.